Today I had the most special experience I’ve had since being in Bali. Sri, the woman who cooks our Breakfast in the mornings, invited us to a very special Bali ceremony for her baby. It is known as the three-month ceremony and is the ceremony celebrating the first time the baby is allowed to touch the ground. Before three months, the baby is considered to have a holy and pure soul and is not allowed to become unclean by touching the ground or floor. Before the baby is three months, it is usually always in someone’s arms. I imagine a Bali baby feeling very loved and protected. We were very lucky to be invited to this ceremony. 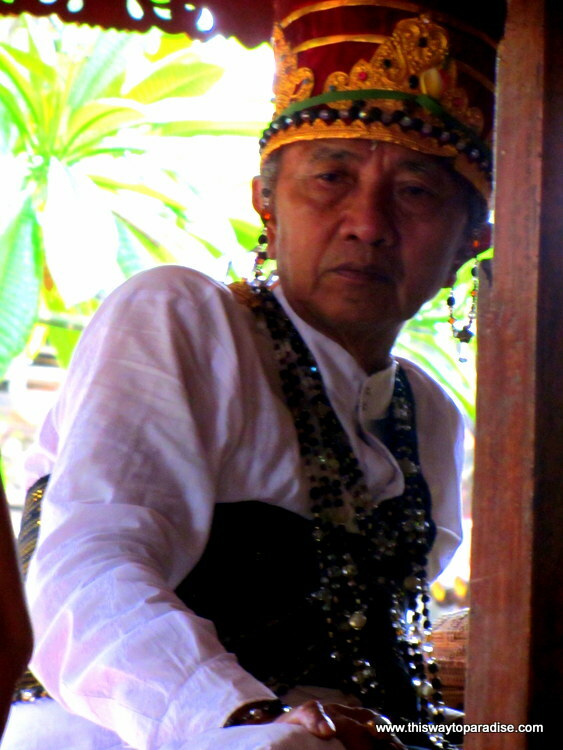 Usually, visitors who aren’t Balinese are not invited to this very sacred ceremony. This is because when a baby is this young, it is considered very susceptible to evil influences and black magic. It is usually a ceremony that is reserved for only family and very close friends. The high priest conducts this ceremony which is also a rare occurrence. It is the most significant childhood ritual in a person’s life. This is also the first time that a baby is allowed out of the compound. Until then, the only time she or he has left the house is to go to the doctor. It is really beautiful to see how much babies are loved and protected here. Many people live in the Balinese compounds, so there is always someone to hold them, someone’s arms for the baby to be surrounded by. 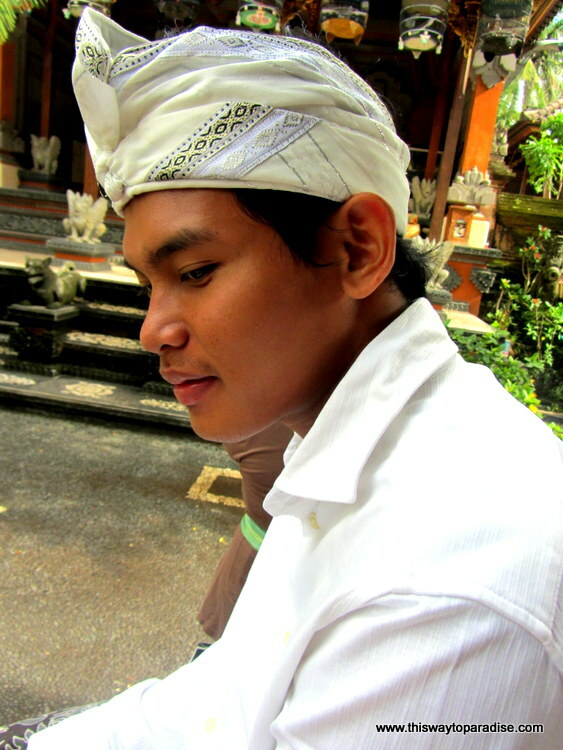 This Bali ceremony was a beautiful event with lots of socializing between the people there. When the ceremony began, the sister and brother-in-law went through an interesting purification ritual in which water was dumped on their heads and cups banged on their heads and thrown on the ground, being broken into pieces. Many offerings were on a platform on which the high priest sat and he performed rituals and prayers in ancient Sanskrit. This is also the time when the baby is first given a name and given his or her first jewelry. I was humbled and in awe to be a part of such a celebration and enjoyed talking to the family members. I talked to a twenty year old boy who was excited to be in chef’s school and already had a job at the Grand Hyatt. This celebration was full of joy, happiness, reverence, and playfulness. It made me feel more of a reverence towards life and how lucky we are all here to be here together. Watching these people who had all come together to help with the preparation to celebrate this child made me wonder what our world would be like if more people came together to celebrate the landmarks and turning points in one’s life. Back home, people get too busy to even keep up with the happenings in each other’s lives, unless they see it on Facebook. Here people spend almost every minute together, and just your presence is enough to make someone light up with a smile. I hope the world will move to a better place where people gather together and show each other not just that they are celebrated, but that they are loved.